One of the key parts of the Affordable Care Act (ACA) is the expansion of Medicaid eligibility to nearly all low-income individuals with incomes at or below 138% of poverty (see chart below). While the Medicaid expansion was intended to be national, the June 2012 Supreme Court ruling made it optional for states. Kansas chose not to expand Medicaid. 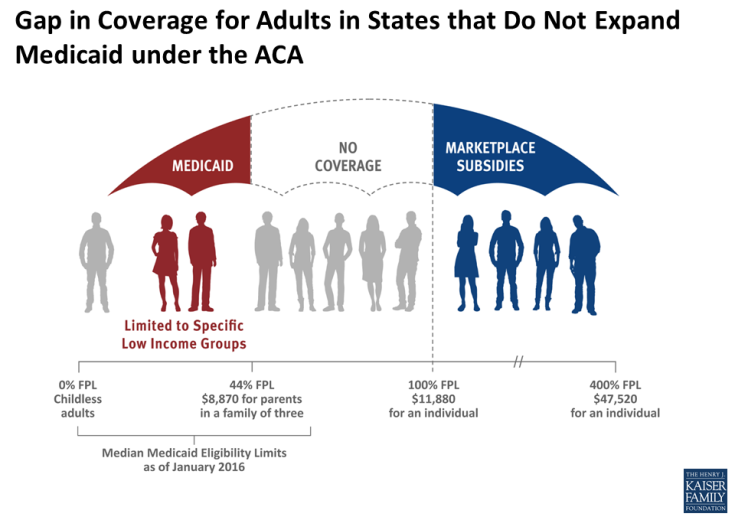 Because the ACA envisioned low-income people receiving coverage through Medicaid, it does not provide financial assistance to people below poverty in the Marketplace. As a result, many adults in Kansas fall into a “coverage gap” of having incomes too high for Medicaid eligibility but too low for financial assistance in the Marketplace. People who fall in the Medicaid gap are not required to have insurance because it's considered "unaffordable" (over 9.66% of their annual household income) and are exempt from the penalty. If you fall in the Medicaid gap, make sure your tax preparer has this information.